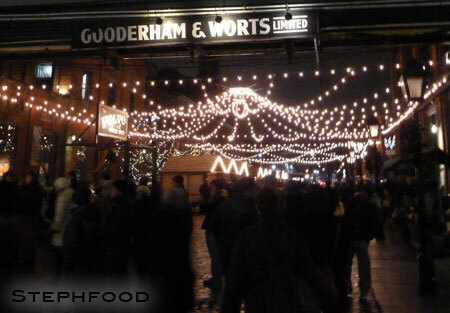 This past weekend, we checked out the Christmas Market at the Distillery District… twice! I’ve been craving a German Weihnachtsmarkt since we were in Germany in 2006. For a brief time, I was incredibly jealous of Vancouver for getting one this year. 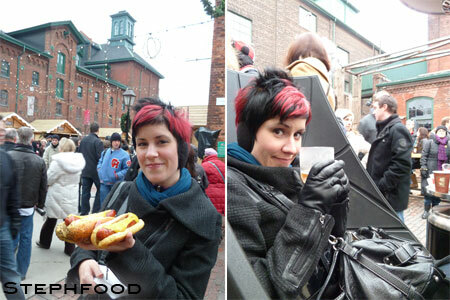 A couple of days later, I found out about the one here in Toronto, in the Distillery District. Initially, I was hung up on the things I remembered of the German markets – things that were missing from ours (like real Glühwein, served in keepsake mugs). Once I got over that, I was able to relax and enjoy the environment and the spirit. The thing about this kind of Christmas market is that it seems to be missing much of the tackiness of the season that we normally can’t seem to escape. Something about the little wooden huts, the smell of the food and the sound of caroling is kind of relaxing and enjoyable – even when you’re standing out in the cold. We went on Friday night, and then again on Saturday afternoon. A very large gingerbread house, and some Xmas cupcakes. There was fun to be had by all ages. Friday night, we definitely saw more adults milling about the beer garden, sampling some yummy Glenfiddich, Amarula and Weihenstephaner beer. Saturday afternoon was definitely for the kids, with some live reindeer, pretty ladies dressed as angels, and other family fun (in addition to the beer garden). There was a variety of food available – mostly decadent treats, of course! The Sweet Escape even made a child-sized (real) gingerbread house. There was a sign to not touch, but I’m pretty sure there was a bite out of the side! I swear it wasn’t from me! The lineup for Soma was out the door and down the street (ridiculous!) on Saturday. Yup, I went in search of sausages. Initially, I was hoping to find some Thuringer sausages like we had in Frankfurt. Instead, we found some tasty Oktoberfest sausages. They hit the spot. Too bad they ran out of Sauerkraut on the Saturday! 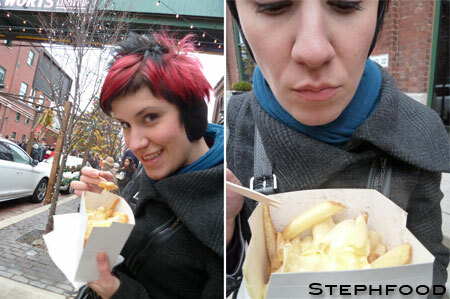 One of the stalls was serving freshly melted Raclette cheese on top of French fries. You could smell it before you could see it – the cheese had a wee bit of stink to it, in a good way. It was gooey and tasty, just as expected. The guy making them had a pretty neat rig, too. There was a heating contraption that fit two blocks of cheese. They would melt the top layer of cheese, and he would scrape the melty goodness onto the fries. Pretty sweet! He was also serving up some choucroute (French for Sauerkraut, but no doubt prepared in its own way). I kinda wanted some cheese and coucroute on my fries, but I think that would have been an expensive box of fries! In all, I think this was a valiant attempt at having a not-so-tacky Christmas event. If this can happen every year, I’m sure it can only get better. Until then, take a look at some other cities’ markets!